I don’t have a lot to say in today’s blog other than it’s been one hell of a week and I’m glad it’s almost over. I’m not planning on seeing any of this week’s new releases. Despite my never-ending admiration for all things Rollins, I actually WON’T be seeing Bad Boys II. I have pretty strong opinion about Michael Bay movies. While you can’t deny they man has a keen visual sense, each one of his films pitches to the lowest common denominator. I won’t support that with my movie-going dollar. I doubt I could even enjoy it on an ironic level. And besides, like I said, this week has been hell. I could stand for a more quiet, introspective affair. I need to see if Whale Rider is playing at any of the local art houses. I’ve heard good things. Real quick: You might notice that the number of posters are dwindling. Slowly, but surely my stock of posters is ebbing away. You really need to put your order in now. Do it before it’s too late – cuz once they’re gone, they’re gone. As always, if you want to pay by check, cash or money order, fire off an e-mail to theaterhopper@hotmail.com and I’ll tell you where to send your payment by snail mail. I’ll cap the blog here for now, but maybe Jared will log in with more anecdotes about his new house. I enjoy our small exchanges about the commonwealth status of states on the Eastern seaboard, don’t you? I was having a little bit of trouble coming up with an idea for the Top Web Comics voting incentive sketch for today. So I kept it pretty simple and just drew a picture of Tom Cruise. It’s a little wonky, but not too bad for 5 minutes at the drawing table. Vote for Theater Hopper at Top Web Comics to check it out. Before I get into today’s comic, let me just take a moment to talk about last week’s comic. I was worried that it was a little too dark and gruesome, but you guys proved me wrong. Support for last week’s Chipmunks comic was phenomenal. You guys did a great job sharing the comic on Twitter, Facebook and StumbleUpon and the result was one of Theater Hopper’s HIGHEST traffic days in MONTHS. Not only was last week’s comic one of the most shared and visited on the site, it was also the HIGHEST RATED comic on the site. 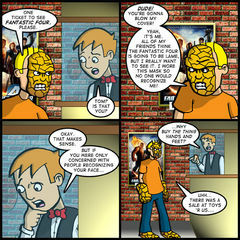 I don’t know if you guys have seen it, but there’s those little stars between the comic and the blog post that you can use to let me know how much you like or dislike that week’s comics. As of this writing, there were 49 votes and an average rating of 9.89 out of 10. That, like, NEVER happens. That’s pretty much like 48 people giving the comic ten stars and one guy giving it one star. Crazy-unheard of. I’m sure the ranking of the comic will flatten over time. But it was just another indicator of how well that comic connected with you guys and I appreciate it. I guess I didn’t realize there was so much latent Chipmunk hate out there! Thanks again! As for this week’s comic, it started out as something completely different. I abstained from seeing Mission: Impossible 3 because I was feeling very much anti-Tom Cruise at the time. I kind of regret that now as several friends have told me that M:I 3 was very, very good. I should have know this because Phillip Seymour Hoffman is in it. So… duh. I suppose there’s nothing keeping me from seeing it now except for time and availability. If Netflix offered it through streaming, I probably would have seen it by now. Alas, that’s not the case. 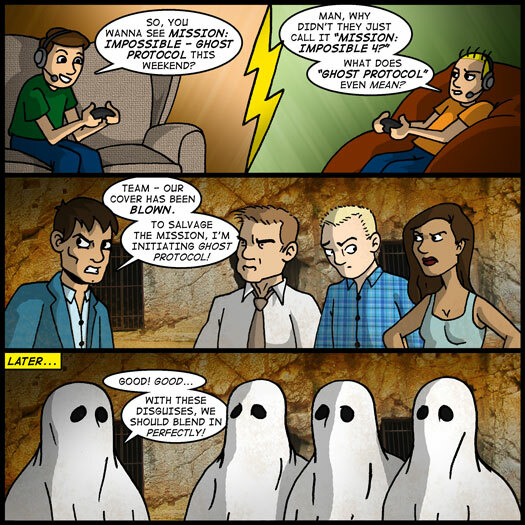 At any rate, the comic was basically going to be about how I was planning on seeing Mission: Impossible – Ghost Protocol, but how Tom Cruise was the absolute LAST reason I was seeing it. For me, the primary reason to go is to see how director Brad Bird (The Incredibles, The Iron Giant) handled his transition from animation to live action. That doesn’t happen very often – if at all. I guess I can’t think of a lot of animators who have made that leap, can you? Bird has a very action-oriented style to begin with and he also has a cynical sense of humor. I wanted to see how much of that could be infused into the Mission: Impossible franchise. Probably the SECOND reason for me to see Ghost Protocol is for the preview footage they’re showing of The Dark Knight Rises in IMAX. We’re luck enough to have an IMAX theater in town and they’re showing it. That’s a big draw for me. From there, I’m interested in seeing Jermey Renner and Simon Pegg. Tom Cruise falls somewhere below that. Really, if you’re the 5th most important reason to see a movie, does it matter where you actually rank? Probably not. Look – I want to like Tom Cruise again. He’s got a lot of charisma and he generally picks good projects. But somewhere along the line, his enthusiasm and intensity wore me out. Tom Cruise will be 50 years-old next year. FIFTY! Anyone who acts like Tom Cruise does at 50 is either in gross denial or is running away from something. Maybe if I have millions of dollars to insulate myself from reality, I’d see life more like Tom Cruise sees it. But as of right now, it’s clear to me we’re not sharing the same planet. I guess the thing that trips me out about the M:I franchise the most is that they’ve been making these films since 1996. That’s nearly 20 years. In some ways, it’s a very unlikely franchise that seems to propagate itself purely on Tom Cruise’s ambition to prove that he can still do his own stunts. If Cruise had opted out after the first or even the second movie, they might have continued making cheesy direct-to-DVD flicks or maybe even rebooted it again completely by now. But when you start talking about an action franchise that’s approaching the 20 year-mark, you’re talking about James Bond-level longevity. Is it any wonder that Jeremy Renner is being groomed to take over for Tom Cruise after he leaves? Follow the money, people. Follow the money. That’s all I have for this week. Next week’s comic might be delayed due to the Christmas holiday. I’ll try to work in advance, but you know how that usually goes. In the meantime, thanks for your continued support. If you liked today’s comic and want to share it with your network, don’t forget the ShareThis buttons below the blog post. 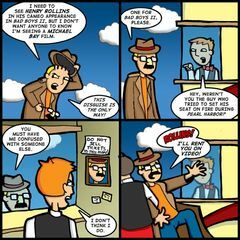 You can use them to share this comic with friends through Twitter, Facebook, StumbleUpon or even e-mail! If you have any comments about Mission: Impossible – Ghost Protocol, be sure to leave them below. I’m curious if anyone saw it in IMAX this weekend and what they thought of The Dark Knight Rises footage? C’mon! Spill! Until then, have a safe and happy holiday! See you next week!